It’s time again for the Golden Pedal Awards, Metro’s annual competition for stories about commuting via bicycling. We collected nominations all throughout Bike Week LA and will be publishing a Why You Ride series with one winner a week — to remind us that every week is Bike Week! 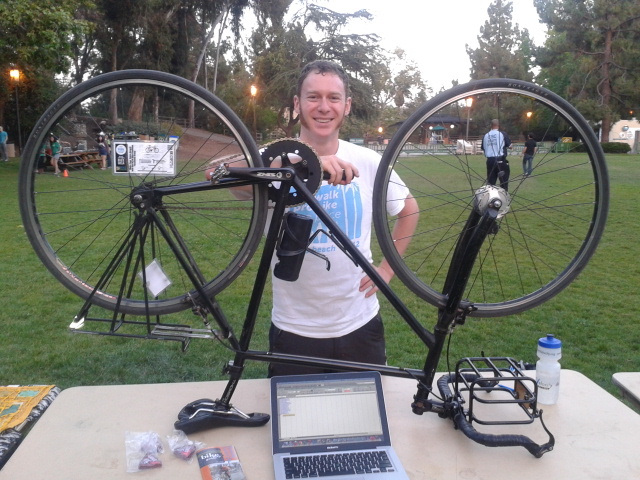 Justin and his bicycle tabling for the UCLA Bicycle Coalition. The front and rear racks on the bike make it easy to carry things on his commute. As an intern in LADOT’s bicycle outreach and planning group, Justin puts his biking experience to good use by creating citywide policies on bicycle wayfinding signage. He’s also helped the UCLA Bicycle Coalition (a regional partner of the Los Angeles County Bicycle Coalition) work with administration and faculty to fund and implement several projects, such as bike counts and bike safety programs. Thanks Justin for your hard work! We’ll be sending you a Nathan reflective LED safety vest, one year of bicycle roadside assistance from Better World Club, reflective safety decals from RydeSafe, and some Clif Bars to help make your commute safer and more delicious. I second the nomination for “bikiest” guy in LA.